When deciding to learn something new, whether it being sports, academics or trading, there always has to be a foundation. You can ask any professional athlete, none of them will say that he was just born tremendous or “I just have a gift “. With excellent results, there will always be the foundation and hard work. All focus and energy we put into learning something new helps us lay this foundation. Today we will start to set the basics or the foundation to your potential GREATNESS in trading. Technical analysis, like all skills, has a foundation. This foundation is called “structure”. When starting out in trading, it is critical, not essential but critical, to understanding structure. How the markets move is based on this. 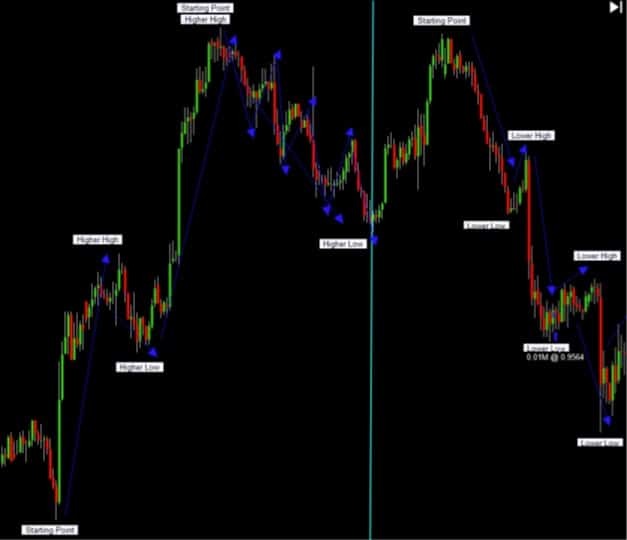 If you refuse to understand and or learn the basics of structure and how markets move, there will be no way for you to become a consistently profitable trader. For the sake of training purposes, we will imagine that we are in construction and we are going to build a house. You do not need to be a rocket scientist to know that you start out with the foundation and you build up from there. Have we said FOUNDATION enough for you already? Well, this is key, and you will need to grasp this to continue, for this will be so important when we come to the “good stuff”. We must point out that this alone is by no means enough for you to go out and start trading, technical analysis is a deep and complex beast and you know that you don’t have a house even though the foundation is there, but it’s a damn good start to a building. There are three ways in which a market moves. When thinking about support and resistance, it is a right way to imagine the resistance as a ceiling and support as a ground or a floor. 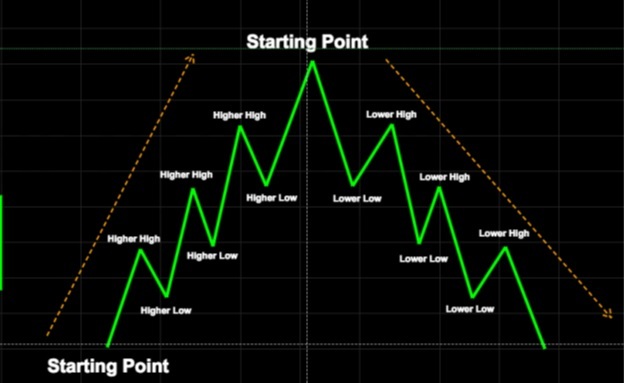 By definition, Support is an area or a point on the chart where buying pressure is stronger than selling pressure and buyers or the Bulls, overcome the sellers or the Bears, creating an area or a point where the price goes up. By definition, the same applies to resistance. 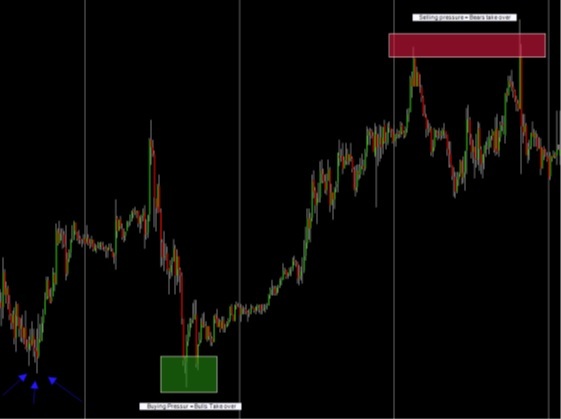 Resistance is an area or a point on the chart where selling pressure is stronger than buying pressure and sellers or the Bears, overcome the buyers or the Bulls, creating an area or a point where the price goes down. As we come down into the Green zone on the chart, we must ask ourselves what happens? Why there? If we see left, it is clear why we run right into a previous structure or support zone. Thought process: We are sellers, and we are starting the selling at the top. When we see that price is getting close to that previous point of support (Green Zone), what are we thinking? Well, this could be an excellent place to take targets right, so we consider targets and get out of the market, YES we made a profit! So we are out and so being others with us and you see the first pullback. Remember there are three types of people in the market: Buyers, Sellers and the undecided. So the first pullback is on the way, is it a pullback or are we off to the sky? In this case, you see that the buyers and the undecided were not sure but were wishing when they saw the string of green candles that they would have jumped on the trade. Then the sellers make another try to get through that support area! When the price comes back down to that level, the buyers and the undecided wake up and smell the roses, this is it! We’re long! Sellers soon see that they were wrong and got out of the market. The market gets flooded with buy orders, and the reversal happens. Support holds! So because we can, we are going to look into the future. Five days have passed, and we notice that price is coming back down to our previous Structure Support zone (Green). It can’t be that price will bounce back from that zone again! It was just a coincident the last time, or was it? No, the same thing happens, what do you know. This ladies and gents is STRUCTURE at work. The same thing happens when looking at the top of the chart. There, the Resistance (Red Zone) is holding in the same way. 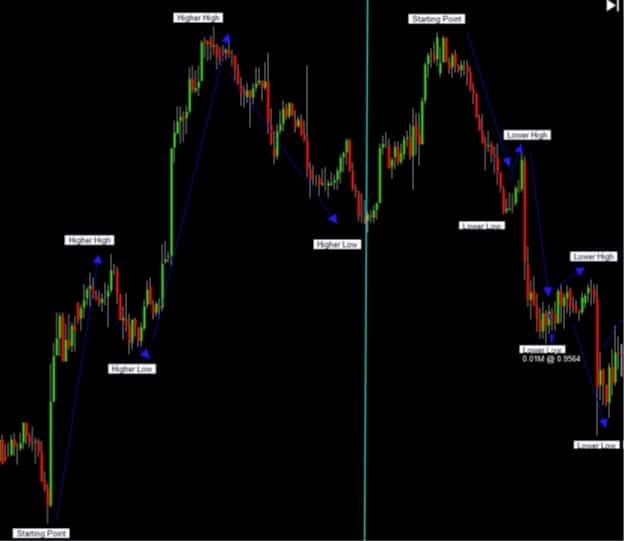 When talking about Trend, we are referring to a specific direction in the market. We can have a Bull Trend and a Bear Trend, meaning with the Bull Trend, price continuously goes up, and with the Bear Trend, price consistently goes down. The trend has to have a starting point. Three components appear in a trend. Now as we look on to the chart which has been drawn on, you can see that this is some simple stuff. But like most things, people tend to disregard the basics and the “simple” material, and the fact of the matter is that if you do not master this, and we mean master it! How price moves in ebbs and flows and why it does, there is no hope for you. But we assume that since you are reading this you are not in that category, and you will indeed master this concept. Let’s see some charts in action and how this works in the market. As we inspect the chart, we can see some examples of how a trend is formed. 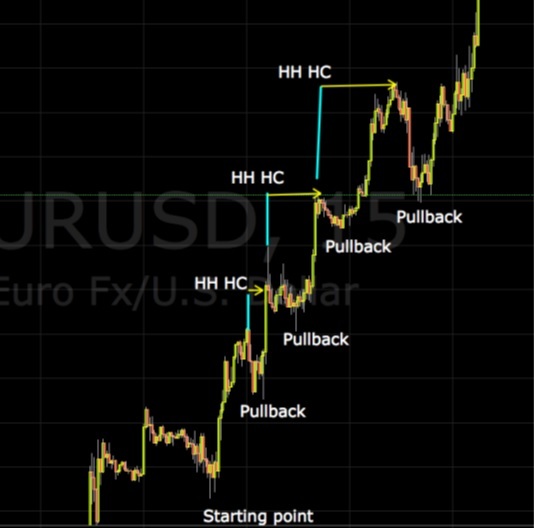 Series of HH and HL in an uptrend and series of LL and LH in a downtrend. I´m sure that many of you are wondering about how and why we draw in the second Higher Low in the uptrend. You may say, isn’t that a downtrend. The answer is yes it is, the reason we draw it as an HL is just be looking at the bigger picture. With time and practice, you will to often see the “bigger picture”, and the only difference is if you are looking long term or short term at the trade, meaning that if we would go to a higher timeframe, you would simply see that “downtrend” as a pullback of a bigger move. 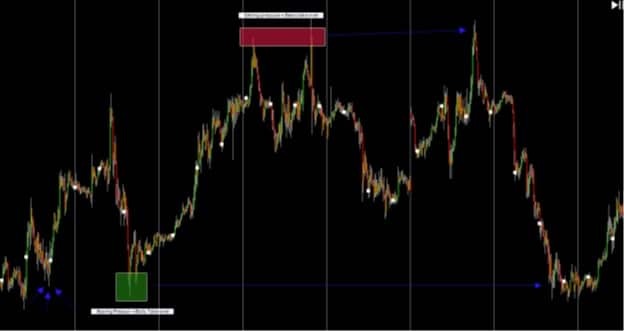 The how and why on drawing into the chart is up to you, this is the fundamental skill in structure analysis, and this is something that you MUST spend all your time in the beginning practicing. You will soon see that it “pays” of knowing what you are looking at when you are starting to analysing your chart. To determent, if in fact a move is expected to continue in the direction it is currently headed we use the HH HC and LL LC principal. This means that if a candle does not close above the highest high of the previous High, we will not consider that a continuation move to the upside. The candle MUST close above the highest high of our previous high and therefore make a new STRUCTURE HIGH, that means above the body and the wig. HH HC = New structure High. Let’s see an example of this. This, of course, also applies to the downward movement, LL LC = New Structure Low. 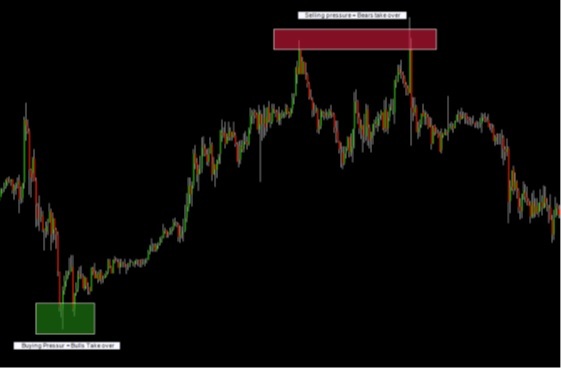 The reason for this is simple: it allows you to be 100% sure on if a move constitutes a new structure high or a new structure low – there is no question. Some traders use the wig, so if the wig is higher than the previous wig or candle they would in some cases consider that a new structure high, that only leaves room to speculate and that is not what we do here. So in closing, the candle must close above/below the previous HH/LL to be considered a New Structure High/Low.